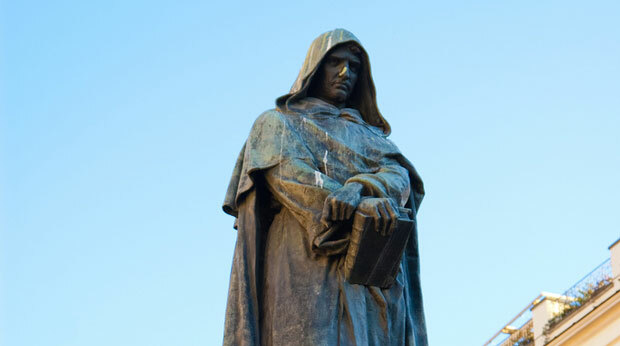 Giordano Bruno was an extremely controversial figure of the Italian Renaissance, regarded as a martyr of free thought and modern scientific advancement by some, and branded as a heretic and pantheist by others. Despite these contradictory views on his personality, his remarkable contributions on mnemonic techniques, mathematics and infinite worlds cannot be denied. Bruno was born as Filippo Giordano Bruno in 1548 in Nola, Naples, to parents Giovanni Giordano Bruno and Fraulissa Savolino. His father was a soldier. Bruno received his early education in Naples and under several tutors at the Augustinian monastery. Upon reaching the age of 17, Bruno was admitted to the Dominican Order of the monastery of San Domenico Maggiore in Naples, where he studied Aristotelian philosophy. Bruno changed his name to Giordano and, at the age of 24 he became an ordained priest. Giordano’s art of memory earned him the attention of Pope Pius V, and he was invited to present him with a demonstration. By this time, Bruno has developed his inclination towards free thought and also took part in condemning religious doctrines, particularly through the ownership of an Erasmus book which had been banned. In light of all Bruno’s conflicts with the church and its religious notions, the Inquisition began preparing an indictment against him. Thus, Bruno had to leave Naples in 1576. He began traveling around Italy for some time, and in 1577 published his work, ‘On the Signs of the Times’, which is now lost. In 1579, he settled in Geneva and began teaching at the University. However, due to certain publications against Protestantism, he was soon arrested. He then moved to France, where he began conducting lectures on various subjects and garnered the support of various influential patrons. He lived in France for the next seven years. In 1582, Giordano published his book ‘De Umbris Idearum’ (The shadow of Ideas), and dedicated it to the French monarch, King Henry III. This action instigated the King’s interest in Giordano Bruno’s work and his lectures on the art of memory. Bruno flourished under the attention he garnered from the French court and patrons, and he went on to publish some of his most influential works during this period, including Ars Memoriae (The Art of Memory), and Cantus Circaeus (Circe’s Song). In 1583, Bruno moved to London, and lived at the house of the French ambassador, Michel de Castelnau. During this period, he encountered some of the prominent and influential members of the Hermetic circle, including the poet Philip Sidney who influenced Bruno so much that he dedicated two of his books to him. He travelled to Oxford to deliver lectures but never managed to secure a teaching position due to his highly controversial religious views. Bruno was an avid supporter of Copernicus’ theories and in 1584, he published ‘Cena de le Ceneri’ (The Ash Wednesday Supper) in which he advocated Copernicus’ heliocentric theory. In the same year, he also published ‘De l’Infinito, Universo e Mondi’ (On the Infinite Universe and Worlds) where he put forward the idea of the universe as an infinite body containing an infinite number of worlds within it. Bruno was the first to present the modern concept of an infinite world. He argued that the universe is a manifestation of God itself, God, who according to him, existed everywhere and not a singular and remote deity. Bruno left England for Paris in 1585, where he did not receive a warm welcome due to the political tension his writings and publications against Aristotelian natural science has created. He decided to move to Germany, where he secured the position of delivering lectures in Wittenberg. Two years later, he went to Prague, and then Helmstedt, but no matter where he went his passion for free thought, his challenging and out spoken personality managed to attract opposition and criticism. However, despite his extensive traveling and turbulent life, Bruno managed to complete several works in Latin, such as the De Magia (On Magic), Theses De Magia (Theses On Magic) and De Vinculis In Genere (A General Account of Bonding). In 1591, Bruno published his highly notable work, De Imaginum, Signorum, Et Idearum Compositione (On the Composition of Images, Signs and Ideas). The same year, Giordano returned to Italy and took up the position of a tutor to Giovanni Mocenigo. This tutorship led to his demise, as his student denounced him and his teachings to the Venetian Inquisition. In 1592, Bruno was imprisoned in Rome on the charges of blashphemy, immoral conduct, practicing magic and heresy. He died on February 17, 1600 in prison after a period of eight years.